(Bloomberg) -- Everyone knows the key to investing is finding an unloved gem. New data show the rewards of taking that philosophy to an extreme. In life, there’s people you ignore, people you dislike, and people you flat-out revile. Analysts at Bank of America took those facts to the market and built an overlay for contrarian stock picking. Some companies are neglected by mutual funds, others are shorted by hedge funds. Combine them and you get the all-hate index whose return tripled the S&P 500 in the past year. A big chunk of the stocks that end up in both columns are defensive utilities and REITs, the groups that gained the most in the 12 months since March 2018. Companies in the basket today include data storage company Western Digital Corp., gold producer Newmont Mining Corp., insurance company Torchmark Corp. and department store Kohl’s Corp.
It’s a sign that holdings by long-only funds and hedge fund positioning data could “complement each other as alpha signals,” Bank of America strategists including Savita Subramanian said in a note. 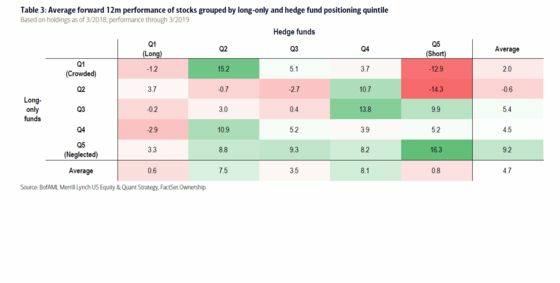 The stocks that did the worst were the ones most shorted by hedge funds and most crowded by long-only funds. They lost 12.9 percent in the 12 months to March, trailing the S&P 500 by more than 17 percentage points. To be sure, objections exist to this kind of theorizing. Academic literature is rife with examples of retrospective strategies that surface in the market then disappear. Looking for clues in the prejudices of groups as different as hedge funds and mutual funds is arguably awkward and may be evidence of too creative a search. The sectors that mutual and hedge funds like the least both today and a year ago include real estate and staples, Bank of America data show. Consumer discretionary and communication services groups are the ones both groups of investors liked a year ago and continue to favor today. Strategists at the bank shifted their stance to cyclical from defensive sectors last week, raising consumer discretionary stocks to overweight from underweight and doing the opposite to utilities amid optimism economic policy backdrop is improving at home and growth slowdown shows signs of easing in Europe and Asia.